Kapulani Landgraf’s installation ‘Au‘a, one of four Honolulu Biennial 2019 works at the Honolulu Museum of Art, almost vibrates with power. 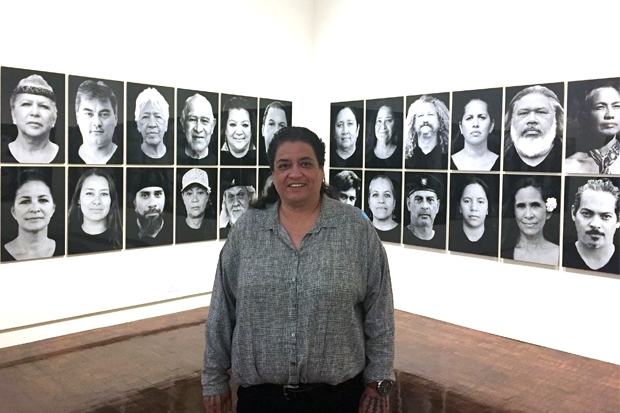 Landgraf is one of Hawai‘i’s best known contemporary artists, and simultaneously has work on view in the Queensland Art Gallery’s Asia Pacific Triennial of Contemporary Art through April 28. 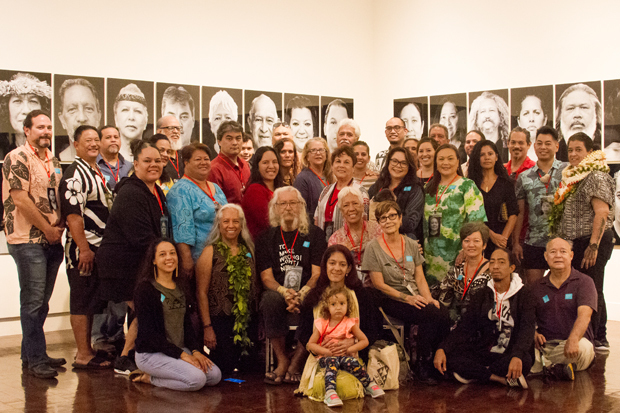 The seed for ‘Au‘a was planted seven years ago, and it began as Landgraf’s response to that speech, and evolved to actually use the speech as part of a series of portraits that together depict an inter-generational continuum of political consciousness. She explores the potential to spur change through civic engagement. And on a more personal level, it’s clear that the project had a profound effect on the participants (read about how it affected four of the subjects in future blog posts). “When put together, it is all about lāhui (people),” says Landgraf. “A collective voice, a collective conviction to correct the wrong. Even though there are only 108 people portrayed in ‘Au‘a, thousands are represented, including all our ancestors and future generations of ascendents.” “‘Au‘a can mean stingy, to withhold, and to refuse. On March 9, Landgraf hosted a viewing of the installation for project participants. More than 80 attended, and their connection with the work—and with each other—was palpable. Before everyone arrived, the artist shared a few words about how ‘Au‘a came to be. How did you arrive at the concept for ‘Au‘a? It was an experience that happened in 2012 at the National Endowment for the Humanities Bridging Cultures Conference. As faculty at Kapi‘olani Community College we went. We were given readings and there was no native perspective included, so I was skeptical already. And when we went there we were broken into groups and people would stand up, introduce themselves, and a lot of them said “I am proud to be American.” I was the last one and I said, “I am not American.” It shocked people to the point that I remember their response. And after they picked up their jaws from the ground, they asked me, “Can you provide us a reading?” So I thought, what am I going to give them? I was scrambling, because how can you give one perspective? What is the right perspective? So I decided to switch and I showed [a video of] Jamaica Osorio’s Kaulana Na Pua, the spoken word. Three minutes and forty seconds…they were crying. They got it. So it was like, how can art transform someone in, like, four minutes? And that stayed with me. Then as part of the Native Arts and Cultures Foundation Fellow [program], they sent [artist] Kaili Chun and me to the Venice Biennale in 2015. I had never been to the Biennale—or Venice. The work to me was very fearless, very political, and I was wondering how come we can’t do that here. So while there, we were thinking of returning to Venice as an independent. And that’s where this idea came. It came completely packaged for me. We couldn’t afford to go back to Venice. And then there was a change in president, and I thought I probably couldn’t show [‘Au‘a] anywhere else. So I sat on it until the Honolulu Biennial asked if I wanted to participate, and I gave them this—I said take this or nothing, and they took it. So the concept incubated for four years! When did you shoot the portraits? Within the last eight months to three months, I photographed people. Was it harder putting the list together or editing the list down? I had a harder time getting people to want to do it in the beginning. That was really difficult for me. For me it’s easy to say I’m not American, but I think for other people there was a lot of…maybe fear, or what the repercussion would be, they may lose their job, they may be going for a federal grant, all of that. So this was probably the most difficult project I’ve ever done. Usually overthink, and when I started this project I didn’t think I needed to overthink, but I ended up overthinking. A lot of the people really wanted to tell me why they couldn’t be in it, and I think having to really listen and take that all in was hard. The first list was people who I consider Hawaiian leaders, who have been fighting for Hawaiian issues from the beginning, like Walter Ritte. And then I went around. A lot of people are friends. When I had a difficult time figuring out who to do, then I would ask the people who I photographed who would they recommend. The images are not identified. Why is that? It’s purposeful to not have names. To protect them or even just not to know who they are—people got to figure it out. And it was very much an individual decision [for each person to participate], but unexpected when [the installation] was put up, it became very much a lāhui, a collective, and that was a pleasant surprise. You don’t know how it’s going to look because you’re working with the individual images. Very powerful and meaningful display of images! Congratulations to Kapulani!